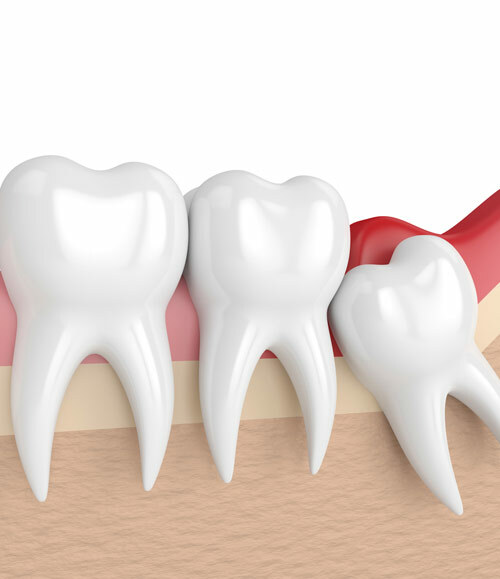 Third molars are also commonly known as the “wisdom teeth”. They are often the last teeth to develop and erupt, often around the age of 18 to 25. Most people will have four wisdom teeth. In majority of the cases, there is not enough space for the lower wisdom teeth to come into full alignment, making them grow crooked or in the wrong direction, hence the dental condition “impacted wisdom teeth”. Although if you are lucky, they may erupt upright and no action may be required if this was the case. Problems related with wisdom teeth could be very serious and could significantly impact your everyday function. During your comprehensive oral examination, our dentist will be able to assess your wisdom teeth and give you advice on if they should be removed. Extractions or removal of wisdom teeth are mostly pain-free and could be simply done on the chair under local anesthetics. However, sometimes when wisdom teeth are in a undesirable position, we would provide alternative treatment options depending on your situation.